Before we explain how to set a deadline MS Project, let’s first define what a deadline exactly means. A deadline is a date by which a certain task/deliverable/milestone must be finished. For instance a need date or any other date you want to manage. Adding deadlines can give valuable scheduling information as it will calculate the days left to this date or signals when the item will be late. 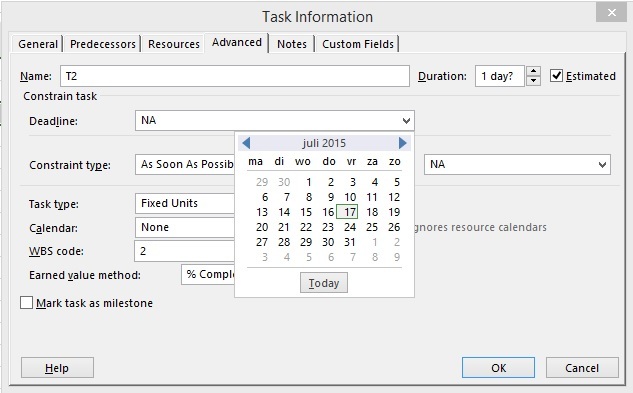 In the Gantt chart a deadline is displayed as a little green arrow. When you hover over the green arrow the deadline date is shown. If the deadline is not met, the red exclamation icon will be displayed in the Indicator column. See example below. Hovering over this icon in MS Project will give you information about the issue at hand. ← What is a milestone? → Do you know all link types in MS Project?